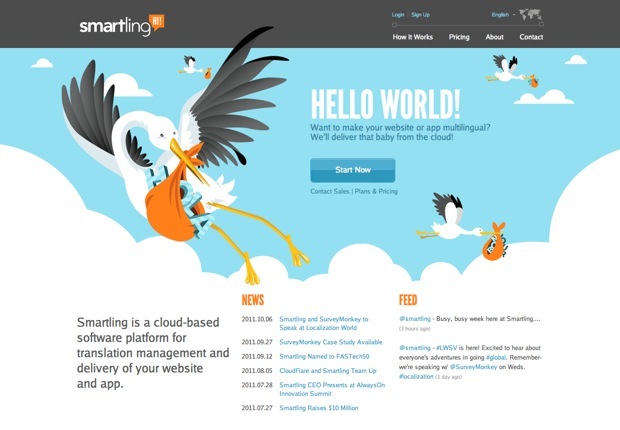 A New York City translation tech venture, Smartling, today released a host of new features and services to help users translate their websites, mobile, and other digital content into many languages, quickly, affordably, and accurately. Despite attempts to automate and manage translation by companies that predated Smartling–from Google Translate to AIT’s Projetex–“content localization” has remained a challenge for businesses large to small for a number of reasons. Translating, say, an English website into Chinese sounds pretty straightforward–just hire a Mandarin speaker with a good knowledge of English, right? But it’s generally far more of a challenge, explained Jack Welde, CEO of Smartling, which is backed by U.S. Venture Partners, Venrock, First Round Capital, and IDG Ventures. For example, business owners have to know if text on a site they want to translate is encoded in something called UTF-8. If not, the site can’t render Chinese characters and will need a code rewrite. Also, companies need to ask “Where am I going to store all my multilingual content? Do I have a database for that?” Welde said. Smartling has been automating the code-crunching process and helping companies find translators–whether robots, pros or volunteers–for about two years. Until recently, the company served large enterprise clients, providing them with dedicated sales staff, tech support, and other hand-holding perks. These were typically beyond the needs and budget of most small businesses and non-profits, however. To reach smaller customers–and continue on their crusade of fostering international business and ideas exchange–Smartling automated its entire process, from signing up clients to recruiting translators. It launched a leaner, browser-based version of its enterprise app recently with some new features going live, today. Pricing starts at zero-per-month for converting a site with up to 5,000 monthly page views into three languages; while $100 per month handles sites with 20,000 monthly page views for five languages; $250 handles 100,000 views and eight languages. The self-service version of Smartling provides robot translators, and allows use of Smartling’s tools to coordinate a bunch of volunteers–i.e. to crowdsource translation, generally. Smartling also offers access to a network of vetted, professional translators, starting at 15 cents per word. While its new, automated tools were specifically created to reach small businesses, they can be handy for big companies, too, helping them get basics done before embarking on a more thorough or far-reaching translation initiative. The first of Smartling’s new tools is a style guide, allowing users to check off style and tone options for translations. For example, will your site use the formal version of “you” (usted, vous, Sie) or the informal (tú, tu, du)? Are abbreviations okay? Those provisions can control automated machine translation of a site, or serve as guidelines for real-live translators. A “progressive glossary” tells robots or translators what words to leave alone. For example, if this site were translated into German, it should still be called “Fast Company,” not “Schnelle Firma,” and “Facebook” shouldn’t be “Gesicht Buch,” too-literal translations. The glossary helps companies avoid painful mistakes known to anyone who has tried Google Translate or Yahoo Babel Fish. Still, bots aren’t wordsmiths. Smartling’s new online service has a tool for going through the robotext and making adjustments manually when needed. It also provides a system to coordinate a hoard of pro or select volunteer translators. Users can curate their crowd instead of just generally crowdsourcing to the public, in other words. Of the small businesses that have been in a trial of the new Smartling services, at least two thirds are crowdsourcing the work, often including help from their own, multi-lingual employees. The new suite provides a system for inviting people to a translation project and for tracking everyone working on it. Some types of sites naturally attract international interest, says Welde. That’s the case with freemium sites, where basic service is free but advanced features have a fee. One of them is Smartling client SurveyMonkey. People are wiling to try the service, but before they pay, they want to make sure it has solid support for the languages they use. 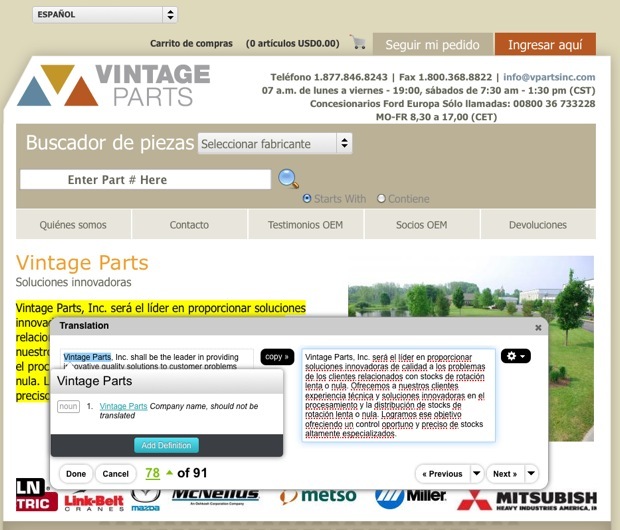 Multi-language sites are important even for companies that do business primarily in North America. Ecommerce sites want to reach Spanish-speaking customers in the U.S. and French speakers in Quebec, for example. Small businesses that have been in Smartling’s trials include bed and breakfasts looking to attract foreign tourists and niche commerce sites, such as Vintage Parts, a provider of spare parts for old machinery. Another hot market for translation: politics. U.S. political candidates on tight budgets–say those running for state assembly–and advocacy organizations all want to reach Spanish speakers in the U.S. Welde says that both politicians and advocates are using Smartling, though he declined to say who. One is an “anti-Sarah Palin” organization. He stressed that Smartling is politically neutral and simply offers its services to anyone. Aside from Spanish, Welde says that the most popular languages requested by Smartling clients today are French, Italian, German, Brazilian Portuguese, Chinese, Japanese, Russian, and Indonesian. Robots can translate into about 50 languages effectively. For live translation, it just depends on who a company can recruit, since crowdsourcing is so popular with Smartling clients. “If you can find someone who wants to translate it into Latin, you can do it,” says Welde.